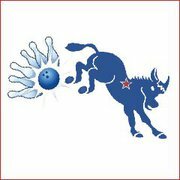 New Britain Democrats’ 3rd annual Bowling Party will be held on Friday, February 24th at Newington’s Bowl-A-Rama, 2143 Berlin Turnpike from 6 to 8 p.m. The evening includes two hours of bowling, shoe rentals, pizza, soda and cash bar. Net proceeds swill benefit the New Britain Democratic Party’s voter engagement and party building activities. $30 per person. $50 for two. Like pizza but don’t bowl? $25. Any costs associated with this message paid for by New Britain Democratic Town Committee, Post Office Box 2112, New Britain CT 06050 Approved by Bill Shortell, Chairman; Shirley Black, Vice Chair; Ann Speyer, Recording Secretary; Alicia Strong, Corresponding Secretary; John Valengavich, Treasurer; Chris Govola, Assistant Treasurer. This entry was posted in Announcements, Fundraiser, Meeting/Event and tagged Bowling, Democrats, New Britain. Bookmark the permalink.